An increased number of cruise ship accidents/incident remains unreported and often absent from the accountability of the civil justice system. Unexpected cruise ship injuries and events are prompted by fierce industry expectations. This is really an issue of cruise industry economics where the vessels no longer sell just the cruise experience, but rather, provide more added dangerous related activities to boost sales. There are more “thrills” available resulting in more injury and deaths. The modern cruise ship can be a floating city of 6,000 people. There are no police or security forces, no limit on alcohol consumption and practically no limit on the ingenuity of the cruise lines to provide “theme park” activities. Consider for a moment, a small town of 6,000 with no rules, no control of alcohol consumption, poor medical care, and total lack of structure to heighten “fun”. Aboard ship, there are multiple opportunities for serious injury. The walkways, pavement surfaces and common hallways are often wet, slippery or unmaintained, host for injuries to the senior citizen passenger population. The passengers, including unsupervised children, are invited to dangerous water slides, competitive sports, rock climbing, basketball, tennis, parasailing, jet ski, snorkeling/scuba diving excursions, bus excursions and a myriad of ways for passengers to get hurt without any supervision. Food and alcohol abound! Drinks are unlimited and passengers are over served, often creating a carnival like atmosphere. When the inebriated passenger meets an unmonitored condition, danger is created. Food and foreign substances fall off overflowing buffet plates and onto the floor. Pools, hot tubs and water activities make decks slippery and unsafe. Look at any online posting for major cruise lines and you will see how many questionable recreational activities are available. Even the swimming pools on cruise ships do not have lifeguards. The medical care, if a passenger gets sick or injured, is often substandard provided by foreign trained staff coupled with a lack of basic medical equipment or procedures for diagnosis and treatment. Under these conditions, it is not surprising there were 76 reported sexual assaults in 2017, an increase of 23% from 2016. Given the sensitive nature of the crime, it is likely that the actual number of sexual assaults is larger than reported. Cruises should be relaxing, enjoyable and safe. But, passengers must be diligent and aware of lurking dangers. 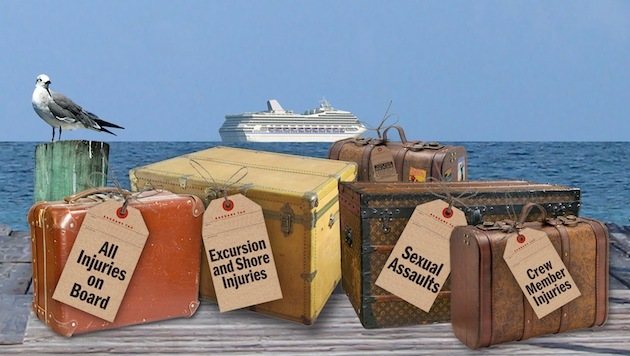 The prudent cruise passenger should make a due diligence inquiry as to the record of the cruise line as far as injuries and hazardous events. Passengers, relying on representation of the vessel, will engage in activities not otherwise part of the vacationing experience. There is too much underage drinking and ample opportunities for all passengers to continue purchasing alcoholic beverages. Interestingly, although many cruises are “all inclusive,” alcoholic drinks are mostly sold as an additional profit item. The industry is so profitable and so fast growing that little attention is paid to preventing measures and there is much more emphasis on marketing and promoting to attract the potential passenger. Please feel free to call us toll free 800-836-6400. We hope your next cruise is enjoyable, relaxing and exciting, and it should be, if you are provided with the proper safety information.